NIUE 5 Dollars 2018 – Crâne de Lion asiatique – 62,2 g Argent 999 finition antique (haut relief) – 500 exemplaires seulement – diamètre 40 mm – prix observé 179,95 euros. Image Power Coin. NIUE 5 Dollars 2018 – Lion’s Skull – 2 oz 0.999 silver antique finish (high relief) – mintage 500 pcs only – diameter 40 mm – observed price $210. Picture Power Coin. 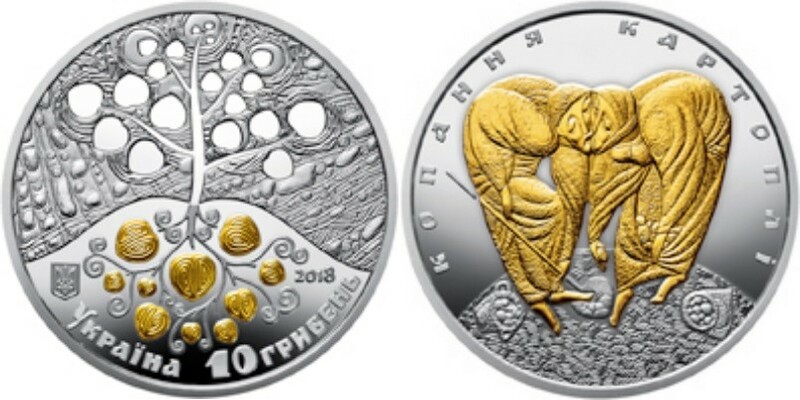 KIRGHIZSTAN 10 Som 2018 – Komuz – 28,28 g Argent 925 Proof – 1000 exemplaires – diamètre 38,61 mm – prix observé 54 euros. KYRGYZSTAN 10 Som 2018 – Komuz – 28.28 g 0.925 silver Proof – mintage 1,000 – diameter 38.61 mm – observed price $65. SUISSE 20 Francs 2018 – SS La Suisse – 20 g Argent 835 Proof – 4750 exemplaires – diamètre 33 mm – prix 50 euros. SWITZERLAND 20 Francs 2018 – SS La Suisse – 20 g 0.835 silver Proof – mintage 4,750 – diameter 33 mm – price $60. FINLANDE 10 Euro 2018 – Europa Star : Baroque et Rococo – 17 g Argent 925 Proof – 8000 exemplaires – diamètre 33 mm – prix 45,90 euros. 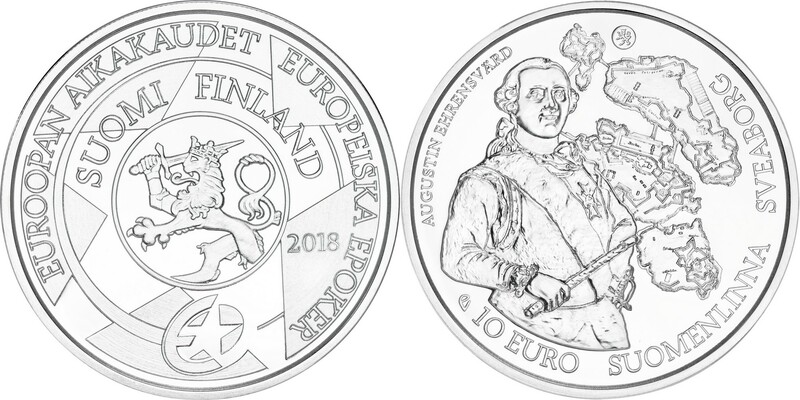 FINLAND 10 Euro 2018 – Europa Star : Baroque & Rococo – 17 g 0.925 silver Proof – mintage 8,000 – diameter 33 mm – price $55. BELGIQUE 10 Euro 2018 – Europa Star : Baroque et Rococo – 18,75 g Argent 925 Proof – 7500 exemplaires – diamètre 33 mm – prix observé 59,90 euros. BELGIUM 10 Euro 2018 – Europa Star : Baroque et Rococo – 18.75 g 0.925 silver Proof – mintage 7,500 – diameter 33 mm – observed price $71. TOKELAU 1 Dollar 2018 – Dame fortune – 31,1 g Argent 999 Proof – 2000 exemplaires – taille 40 x 40 mm – prix observé 139 euros. TOKELAU 1 Dollar 2018 – Lady of Fortune – 31.1 g 0.999 silver Proof – mintage 2,000 – size 40 x 40 mm – observed price $164. NIUE 1 Dollar 2018 – Système solaire : Vesta – 31,1 g Argent 999 finition antique (monnaie convexe) – 666 exemplaires – diamètre 38,61 mm – prix observé 189,95 euros. Images Pela Coins. 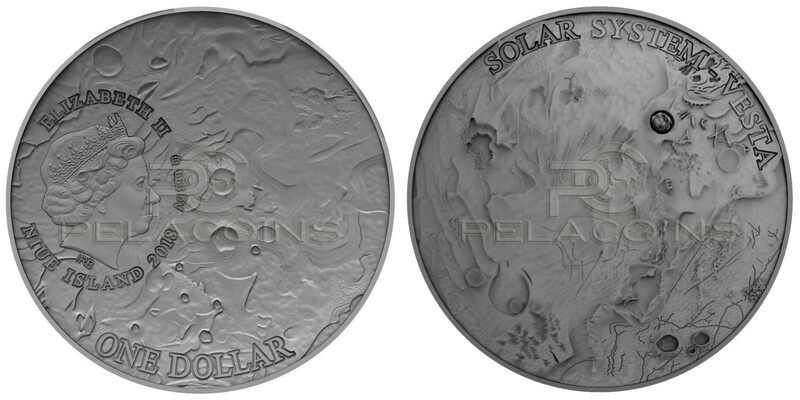 NIUE 1 Dollar 2018 – Solar System : Vesta – 31.1 g 0.999 silver antique finish (convex coin) – mintage 666 pcs – diameter 38.61 mm – observed price $224. Pictures Pela Coins. CAMEROUN 500 Francs CFA 2018 – Vous n’êtes pas seul – 20 g Argent 999 Proof – 999 exemplaires – taille 33,07 x 42,50 mm – prix observé 89,95 euros. Images Power Coin. 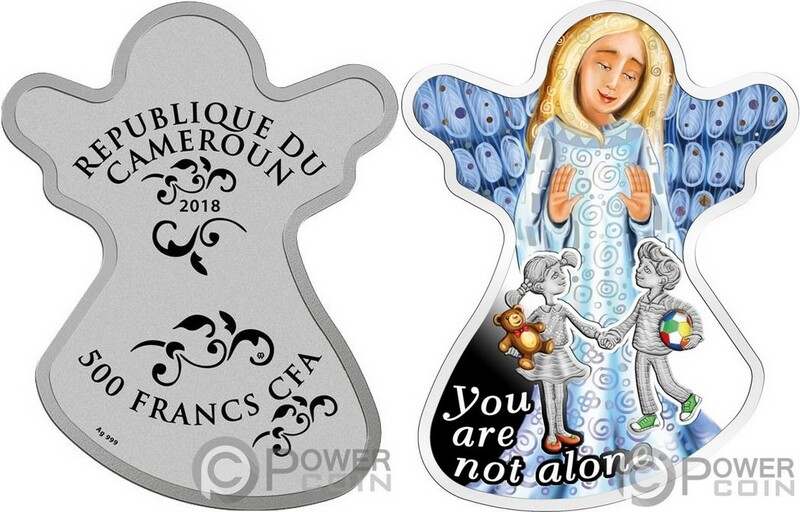 CAMEROON 500 Francs CFA 2018 – You are not alone – 20 g 0.999 silver Proof – mintage 999 pcs- size 33.07 x 42.5 mm – observed price $106. ALLEMAGNE 20 Euro 2018 – 800 ans de Rostock – 18 g Argent 925 Proof – 200 000 exemplaires – diamètre 32,5 mm – prix environ 45 euros. 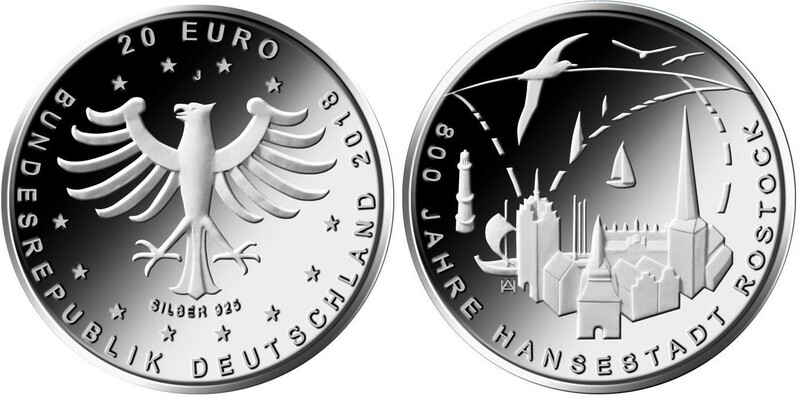 GERMANY 20 Euro 2018 – 800 years of Rostock – 18 g 0.925 silver Proof – mintage 200,000 – diameter 32.5 mm – approx. price $53. UKRAINE 10 Hryvnia 2018 – Planter les pommes de terre – 33,74 g Argent 925 Proof – 4000 exemplaires – diamètre 38,6 mm – prix ignoré. UKRAINE 10 Hryvnia 2018 – Potato Digging – 33.74 g 0.925 silver Proof – mintage 4,000 – diameter 38.6 mm – unknown price. UKRAINE 10 Hryvnia 2018 – Barbu du Dniepr – 33,74 g Argent 925 Proof – 2500 exemplaires – diamètre 38,6 mm – prix ignoré. NIUE 1 Dollar 2018 – Oeuf Fabergé pelican – 16,81 g Argent 999 Proof – 999 exemplaires – taille 29,2 x 39 mm – prix ignoré. Images Gold Silber Coins. 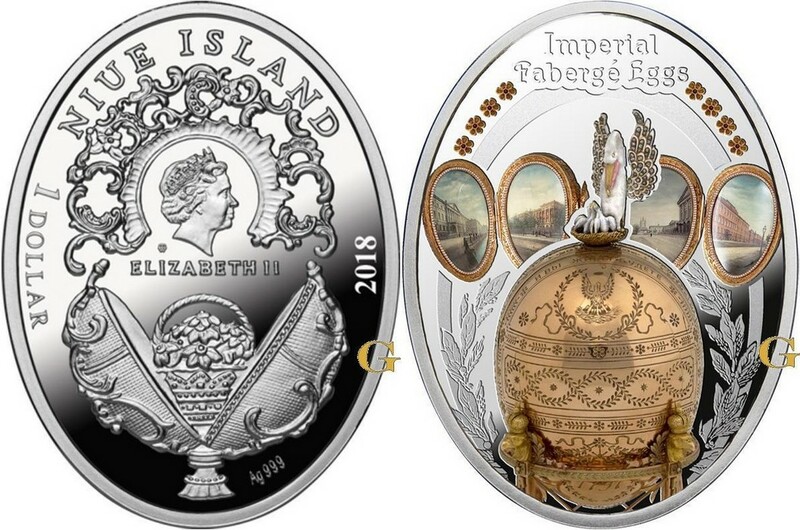 NIUE 1 Dollar 2018 – Fabergé Egg Pelican – 16.81 g 0.999 silver Proof – mintage 999 pcs – size 29.2 x 39 mm – unknown price. Pictures Gold Silber Coins. LETTONIE 5 Euro 2018 – Monnaie miel – 16,5 g Argent 925 Proof (plaqué or) – 3000 exemplaires – diamètre 29 mm – prix 53 euros. 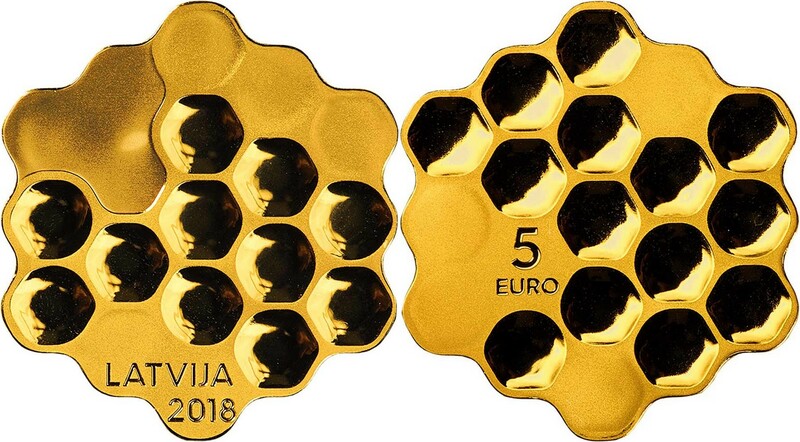 LATVIA 5 Euro 2018 – Honey Coin – 16.5 g 0.925 silver Proof (gilded) – mintage 3,000 – diameter 29 mm – price $62. NOUVELLE-ZELANDE 1 Dollar 2018 – Mariage royal de Harry et Meghan – 31,1 g Argent 999 Proof – 1500 exemplaires – diamètre 39 mm – prix observé 99,95 euros. Images Power Coin. 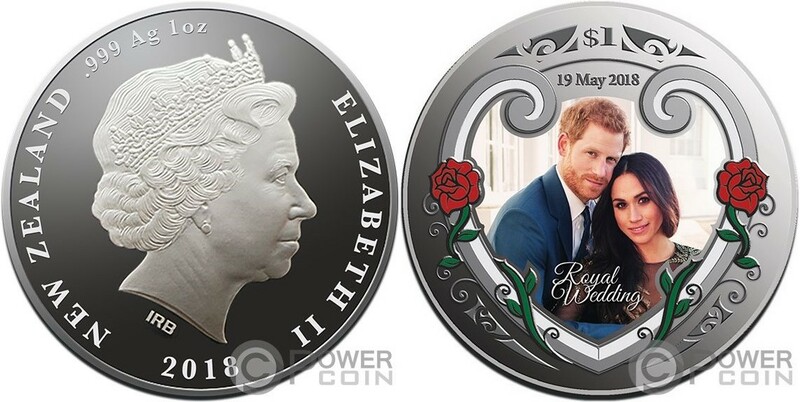 NEW ZEALAND 1 Dollar 2018 – Royal Wedding Harry & Meghan – 1 oz 0.999 silver Proof – mintage 1,500 – diameter 39 mm – observed price $118. Pictures Power Coin. 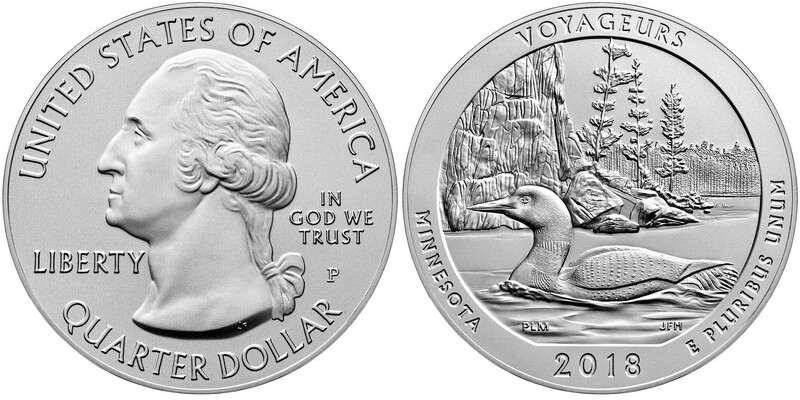 ETATS-UNIS 3 x Quarter Dollar 2018 – America the Beautiful – 3 x 155,52 g Argent 999 UNC – 20 000 exemplaires – diamètre 76,2 mm – prix 132 euros. Existe en finition bullion. 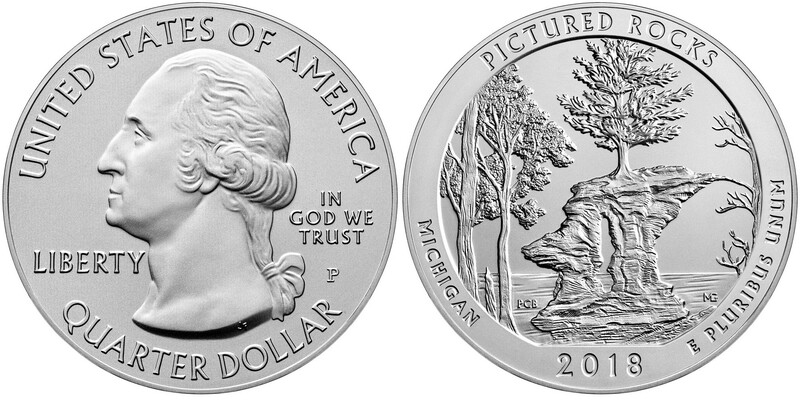 UNITED STATES 3 x Quarter Dollar 2018 – America the Beautiful – 3 x 5 oz 0.999 silver UNC – mintage 20,000 – diameter 76.2 mm- price $154.95. Bullion finish exist. POLOGNE 20 Zloty 2018 – Bataille de Hodow – 28,28 g Argent 925 Proof – 18 000 exemplaires – diamètre 38,61 mm – prix 42 euros. POLAND 20 Zloty 2018 – Battle of Hodow – 28.28 g 0.925 silver Proof – mintage 18,000 – diameter 38.61 mm – price $49. 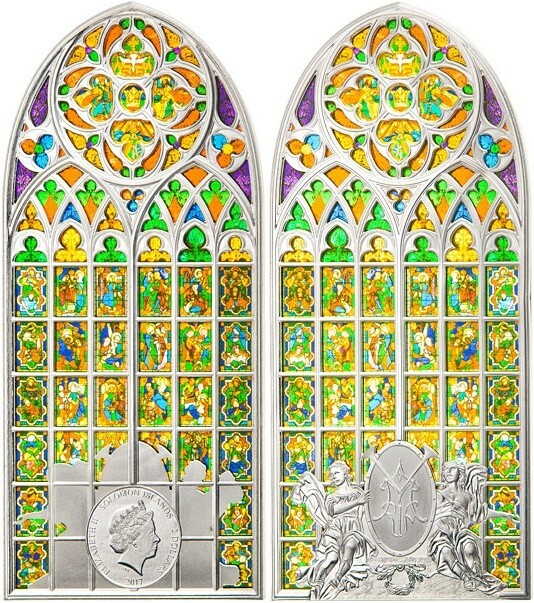 SALOMON 2 Dollars 2017 – Basilique Sainte Marie – 80 g Argent 999 Proof – 1000 exemplaires – taille ignorée – prix ignoré. 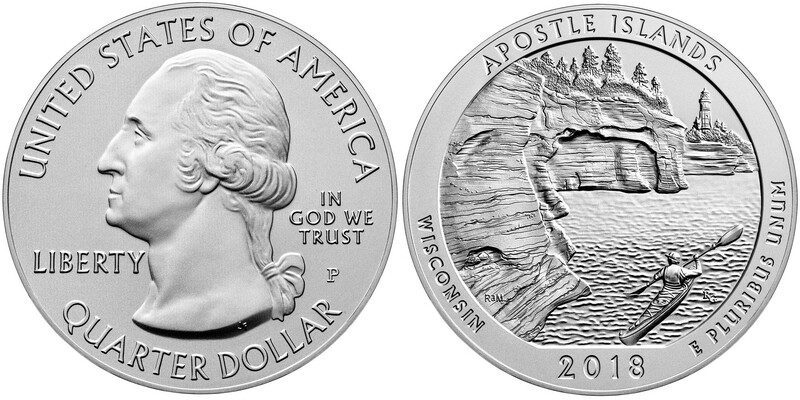 SOLOMON 2 Dollars 2017 – St Mary Basilica – 80 g 0.999 silver Proof – mintage 1,000 – unknown size and price. CAMEROUN 500 Francs CFA 2018 – Ave Maria : Domenico Beccafumi – 17,5 g Argent 999 Proof (plaqué or) – 500 exemplaires seulement – diamètre 38,61 mm – prix ignoré. 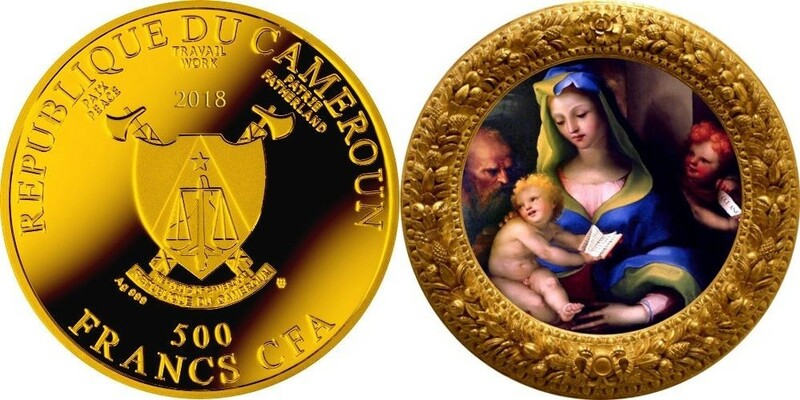 CAMEROON 500 Francs CFA 2018 – Ave Maria : Domenico Beccafumi – 17.5 g 0.999 silver Proof (gilded) – mintage 500 pcs only – diameter 38.61 mm – unknown price.